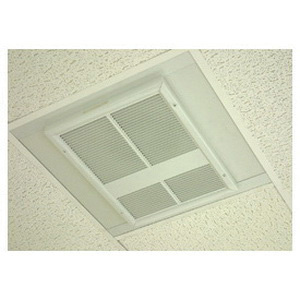 TPI 3380 Series Fan forced ceiling heater has a steel block fin element and a manual reset thermal limit for de-energizing heaters if over heating occurs. It comes with a fan purge circuit that includes a 2-Wire control circuit for use with remote wall thermostat. This heater in white powder coating, has a disconnect switch. The commercial heater features a vane axial fan blade with 700-RPM motor for providing air flow of 175 CFM. Heater has voltage rating of 120-Volts AC and current rating of 12.5-Amps. The heater is cETLus listed.